A trip to Wisconsin would not be complete (at least, in my book) without some serious cheese eating. This is America's Dairyland, after all. So, to finish up this 48 Hours in Wisconsin series I wanted to share a little info about... what else? What we ate! 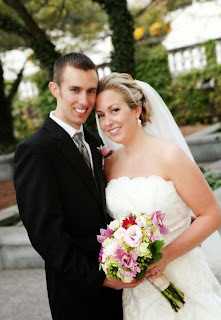 First, I'd like to tell you about a fabulous dinner we had in downtown Milwaukee. Having already enjoyed a more sophisticated (read: expensive) tasting dinner at The Immigrant on Friday night in Kohler, our plan for Saturday was to find something in Milwaukee that was fun, different, and delicious without totally bankrupting us. We found that at Millioke. Millioke's tagline is "Meat. Cheese. Beer." That's really all you could ask for at a dinner in Milwaukee, right? Well, it was certainly more than that. The atmosphere of the restaurant was great-- a perfect combo of sleek modern decor with comfortable rustic elements and the menu followed suit. Local products and traditional Midwestern dishes were heavily featured on the menu, but each with an updated more upscale feel. The restaurant reminded me a lot of some of our favorite Chicago restaurants like Farmhouse or TWO that have similar menus and concepts. Alex and I had been drinking beer all afternoon (see this post for more info on our Lakefront Brewery tour) so when we sat down and saw a beer cheese fondue with soft pretzel bites on the menu we were pretty much sold on an appetizer. The fondue was creamy with that delicious sharp flavor of cheddar and beer. It was so good that our watier (who was super sweet, by the way) had to bring us a second basket of pretzel bites to finish it off. Selecting an entree was also very easy for me. As soon as I saw two of my favorite ingredients in one dish-- Brussels sprouts and bacon-- my mind was made up. The pan-roasted chicken breast with bacon Brussels sprouts and old fashioned mashed potatoes was delicious. Everything was flavorful and cooked perfectly-- I love chunks of potatoes in my mash (just like mom made them!) and the thick dice of chewy bacon on roasted Brussels sprouts were so good I could have simply eaten a bowl of those for my dinner! Two notes on entrees: 1. Apologies for that awful photo of my chicken. 2. Alex ordered the Baby Back Ribs and ate the entire thing. Millioke's dessert concept is something that more restaurants should offer: shooters! Because after eating a bowl of cheese with pretzels and what seemed like half a chicken, I definitely needed something sweet but an entire slice of dessert would be a bit excessive. These little shooters were the perfect size: one Door County cherry cobbler and one strawberry cheesecake to share. Before we headed out of town on Sunday, we stopped for some authentic Milwaukee pizza. Didn't know that was a thing? Neither did I. Well, in my last post about things to do in Milwaukee I referenced a great guide to the city that the New York Times put together. One of the article's recommendations was to check out Zaffiro's, home of Milwaukee-style pizza. Alex considers himself a bit of a pizza aficionado so we stopped in for a quick lunch. According to the NYT, Zaffiro's pizza is quintessential Milwaukee-style: a tangy tomato sauce on thin crust topped with high quality cheese (it always comes back to the cheese in this state) sliced up in their signature "party-style" squares. Zaffiro's is a no frills almost divey bar and pizza joint, but it's clearly a favorite with the locals. Our waitress seemed to know everyone in there, but us! And for good reason-- the prices were reasonable, the portions huge, and the pizza really tasty. I love a good thin crust and this was the perfect kind: crispy, but not cracker-thin and hearty enough to support some toppings. I ordered a plain cheese (to go along with their enormous Zaffiro's salad. Alex went with one of their most popular: the EBF or "Everything But Fish," (a.k.a. anchovies). We both really enjoyed our lunch here and I would totally recommend stopping in during your trip. I'm always looking for more authentic places to eat when traveling to new places and this certainly felt like an authentic neighborhood place. And the pizza was delicious! Last, but certainly not least, we made a stop in Kenosha (just over the Wisconsin border, straight north of Chicago) at the famous Mars Cheese Castle. Locals and food lovers alike have told me about this place several times, but this being only my second trip to Wisconsin it was also my first opportunity to check it out... and I didn't want to miss it. This place is kind of unbelievable. It's right off the highway and is, in fact, a castle. They carry a wide variety of local beer, wine, meats, candies, and specialty foods and even have a bar, cafe, and bakery on the premises as well. And of course, they have a completely overwhelming selection of cheeses available too. I was not only impressed by the variety here, but also by how knowledgeable the staff was about all of the products too. We walked out of Mars Cheese Castle with several kinds of cheese: smoked mozzarella, cherry cheddar, pepper jack, pepper cheddar, Applewood smoked cheddar, and a light cheddar that came highly recommended by one of the ladies working in the cheese section. Additionally, we picked up some fun beer, local Wisconsin honey, Neuske's Applewood smoked bacon (in my opinion, the best kind), and we even found some Usinger's sausage, which made me pretty happy since we missed out on visiting their shop in Milwaukee. If you're a food lover and you find yourself in or near Kenosha, make sure you stop into Mars Cheese Castle! And speaking of restaurants, don't forget to enter my $25 Zagat Dining Card giveaway! I hope that you are spending this day relaxing with loved ones, eating good food, and enjoying yourself. I also hope you will save your shopping until tomorrow... Just saying. I'm feeling very grateful today too. 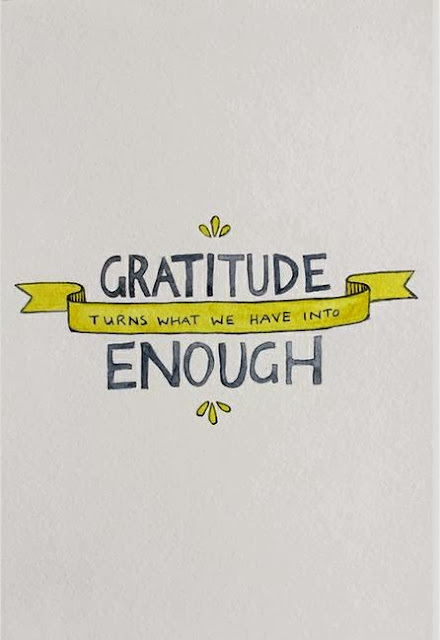 Sometimes it's tough to focus on the positive in the craziness of everyday life, but it's nice to take a moment today (or any other day, really) to be thankful for all of those good things too. Life is good. 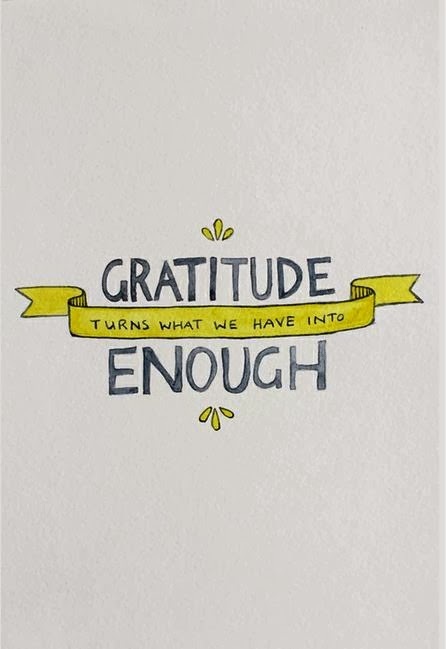 Want something else to be grateful for? Don't forget to enter my $25 Zagat Dining Card giveaway! I know that today is a very busy day for you if you're a cook like me-- there is a lot to get prepared for tomorrow, the biggest American eating (and cooking) day of the year. I'll be at the office for the morning and then spending some quality time with my little sister Emma this afternoon (she's visiting us for Thanksgiving, as has been our tradition for the past few years). And by quality time, I mean I will be bribing her with some dinner and cocktails out on the town in exchange for her help in peeling potatoes, chopping vegetables, and all those other tedious Thanksgiving meal prep tasks on today's to do list. Knowing that you're busy and likely not thinking about any dinner beside that turkey you're currently thawing out. So, this is a great one that you can serve as a fun and easy dinner, a game day snack, or a party appetizer. You could also sub in your leftover Thanksgiving turkey for chicken here if you're looking for a creative different way to use up your leftovers! 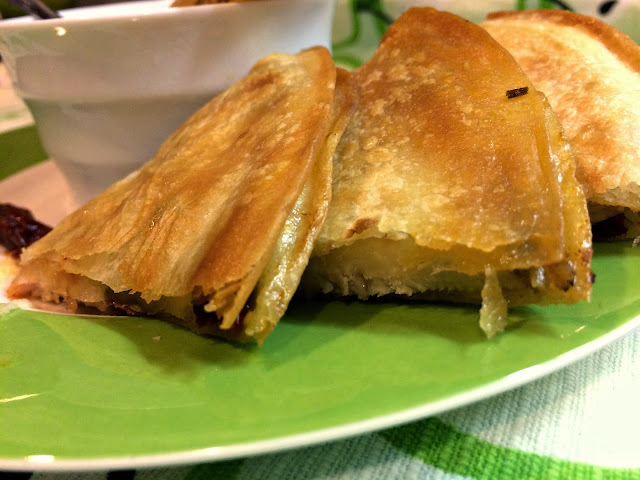 There are only a few ingredients here, but the flavor combination is really wonderful. Truthfully, these quesadillas were born out of me trying desperately to make room in my refrigerator. 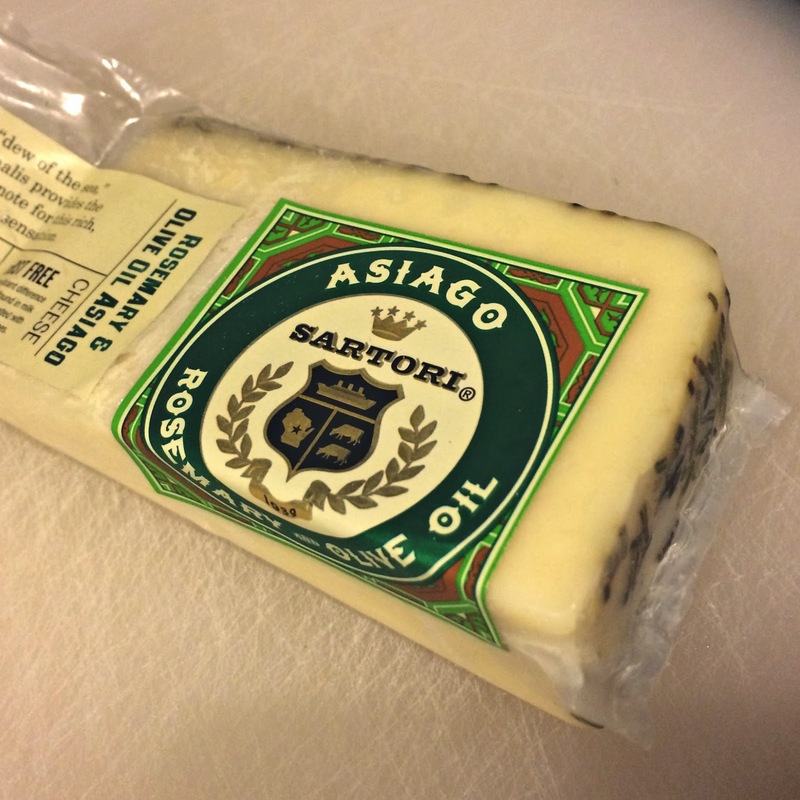 My parents had been visiting and left some snacks in our fridge including this Sartori rosemary & olive oil cheese. This savory herbaceous cheese paired really nicely with tangy sun-dried tomatoes and chicken melted inside of flaky tortillas. As a sidenote, make sure that you drizzle the quesadillas with olive oil and bake them in the oven to achieve this flaky, almost pastry-like exterior. I finished it all up with a creamy sweet and sour dipping sauce that is super easy to put together-- just mix it all up in a mini chopper or food processor and you're done! So, keep this recipe in mind if you'll be feeding a crowd this holiday weekend, if you have turkey (or chicken) to use up, or if you're just tired of really involved cooking after making a Thanksgiving dinner. This is the recipe for you! Lightly grease a baking sheet with olive oil and evenly arrange 3 tortillas on top. 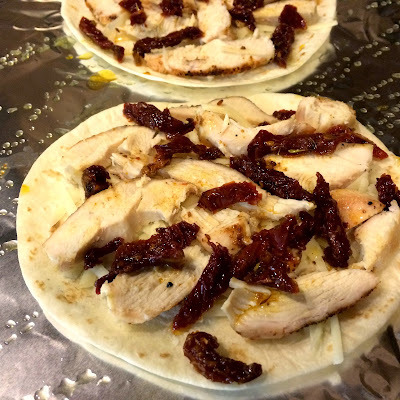 Sprinkle half the cheese evenly on top of each tortilla and top with sliced chicken and 1/2 cup sun-dried tomatoes. Top with remaining cheese and place a second tortilla on top of each one. Drizzle with olive oil and bake for 12 minutes. Gently flip each quesadilla and bake for an additional 5 minutes. In a mini chopper or food processor combine yogurt and next 5 ingredients (through parsley), remaining 1/4 cup sun-dried tomatoes, 1/2 Tbs. of reserved oil from the sun-dried tomato jar, and salt and pepper to taste. Blend until smooth. 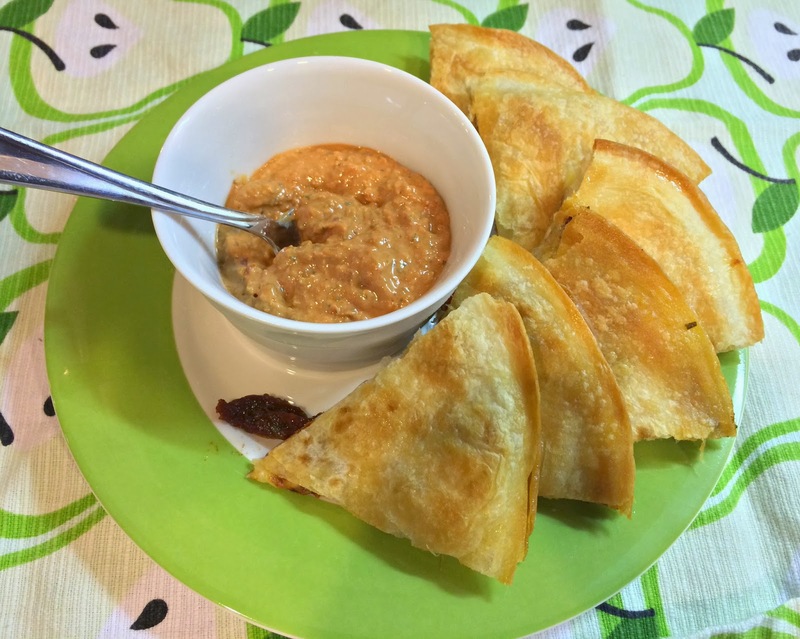 Serve quesadilla triangles warm with sun-dried tomato yogurt dip. And don't forget to enter my $25 Zagat Dining Card giveaway! 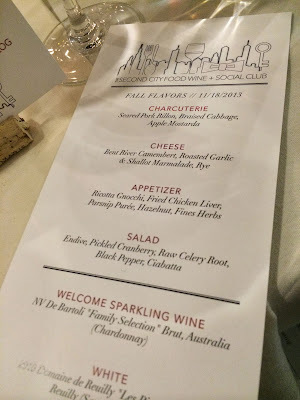 Last Monday I had the very fun opportunity to attend The Second City Food Wine + Social Club's very first event. SCFWSC is an underground supper club founded here in Chicago by a group of bloggers with a passion for food, wine, and fabulous social events. So, they got together with a sommelier and a chef (who shall remain anonymous) from high-end Chicago restaurants to pull the whole event together. And they did an amazing job. We showed up at the mystery dinner location (we only found out where to go the night before) and were greeted with sparkling wine while we mingled with the other guests. The event space looked beautiful-- it was very rustic chic with wine bottles and candles adorning the center of each table. You can check out more details about how the tablescape came together on Katharine's blog Living's Easy as 312. The SCFWSC really paid attention to all of the details for this event. How cute are these placecards? We each received a custom placecard with a tagline created for each of us. And I loved mine! "Curator of the good life in the Windy City." Amazing. The sommelier walked us through the ins and outs of a proper wine tasting and it was really fascinating. We learned so much about how to smell and taste wine, identify the notes, interesting facts (the major takeaway of the night seemed to be that sulfites = hangovers), and of course, we sampled 3 really amazing wines. We tried a great Sauvignon Blanc, a Lebanese red, and my favorite: a 2010 Le Terrazze Rosso Conero, Marche (Montepulciano). I've been an Italian wine fan since I lived there years ago, so no surprise that I would end up favoring this one! And what food and wine event would be complete without some amazing food? Chef created a delicious fall-themed menu and I can't say enough good things about it. That gnocchi was perfection and I'm obsessed with the shallot marmalade that he created to serve with the Camembert cheese. I'll definitely be trying to recreate that recipe in the very near future. If it's good, you'll be sure to hear about it! Thanks so much to The Second City Food Wine + Social Club for a fantastic evening! And speaking of fabulous food and wine, don't forget to enter my $25 Zagat Dining Card giveaway! Enter to Win a $25 Zagat Dining Card! Windy City food lovers, I have some very exciting news to share with you today: The Zagat Dining Card has arrived in Chicago! You may not be familiar with their Dining Card, but I'm almost certain that you've heard of the Zagat Guide-- a comprehensive collection of ratings for some of the world's best restaurants and bars. It's essentially the restaurant-lover's bible. Well, the folks at Zagat have made it even easier for you to enjoy these fabulous restaurants with the introduction of the Zagat Dining Card. This e-gift card is brand new to Chicago, is super easy to use (just print it out or pull it up on your mobile phone), and it can be redeemed at dozens of participating Zagat-rated restaurants around the city. And do you want to hear the best part? The wonderful people at Zagat have asked me to give away a $25 Zagat Dining Card to one of you readers! If I were the lucky winner of this contest, I would finally give Riccardo Trattoria a try. Or maybe I'd head back to Coco Pazzo, where Alex and I had dinner the night he proposed. There are so many different (and delicious) Chicago restaurants participating in this program though, that it would be tough to choose-- a good problem to have! For you readers from outside of the Chicago area, fear not-- it can also be used at participating Zagat-rated restaurants in New York City and Washington DC. And if you're not near any of those places, then this would be a fantastic gift for friends, family, colleagues, or any other restaurant lover in your life-- and just in time for the holidays! Entering the contest is simple: Just use the Rafflecopter widget below (it may take a few seconds to load) to unlock multiple opportunities to enter. The contest is open through 11:59 PM on Friday, December 6, 2013. A winner will be chosen at random on December 7, 2013. 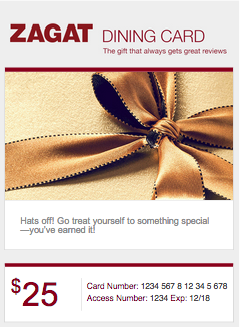 Want to give a Zagat Dining Card as a gift? Click here to purchase one. The Zagat Dining Card is accepted at participating Zagat-rated restaurants in Chicago, New York City, and Washington DC. The Zagat Dining Card program is managed by Smartbox Experience, Inc. and cards are issued by Sunrise Banks, Member FDIC. The Zagat mark, branding and content are owned by Google, Inc. I can't believe that A Squared is turning 2 today! It doesn't seem that long ago that I launched my third blog, named it A Squared, and prayed that I would follow through with publishing more than 3 posts on it before I got bored and gave up. Well, 2 years and over 400 posts later here we are. Thank you all for coming along on this journey with me and watching as A Squared evolved from a place where I could occupy my post-wedding free time with random thoughts to a community of people who love cooking, restaurants, travel, Chicago, and talking all about it. I couldn't be more appreciative of all of your support! 10. Carbo-Loading: Chicago Marathon Weekend - Crazy that this post was added last month and is one of the top 10 of the last 2 years! In celebration of Alex's big Marathon run, I posted a round up of some of my favorite healthier pasta recipes for your carbo-loading needs. 9. Fall Recipe Round-Up: Rhode Island Edition - You all love a recipe round-up! This one is also from just last month and includes a few delicious original recipes and some found around the internet and blog world for yummy fall foods like pumpkin oatmeal scotchies, maple whipped cream, and more! 8. Using Up Leftovers: Roasted Chicken Parm Pasta Bake - This recipe makes a fabulous one dish dinner and is an excellent way to use up the flavorful chicken left over from my sun-dried tomato roasted whole chicken. 7. My Top 10 Post-Holiday Detox Ingredients - A helpful list for this time of year! Ingredients that will help you detox and de-bloat after indulging during the holidays. 6. What's For Dinner Wednesday: Beach Bar Tomato Soup - Not a surprise that this one cracked the top 10! If you are from southeastern Michigan or have ever been, you have likely visited the Beach Bar, tried their amazing creamy tomato soup, and Googled it to death trying to find the recipe. Here it is. Enjoy! 5. What's For Dinner Wednsday: Legal Sea Foods-Inspired Baked Scrod - This recipe is another one inspired by a favorite regional restaurant. Legal Sea Foods is a New England institution and their buttery crumb-topped baked scrod is one of their most recognizable dishes. 4. A Note for my Husband on our First Anniversary - I just love that you guys love this one! 3. My Favorite Things: The Perfect Pair of Jeans - This is a bit of a surprise, but this post about my love for Paige Denim is the third most popular post in A Squared history. It was posted in September of last year and I have about worn these jeans out... time for a new pair! 2. What's For Dinner Wednesday: Post-Thanksgiving Apple Cider Glazed Turkey - This recipe was inspired by one I found in Real Simple Magazine and it was just SO good! I'm pretty sure we'll be having a cider glazed turkey for Thanksgiving this year too. 1. Another Gratuitous Granola Post - Your favorite post of all time is this healthier granola recipe! Really? It still surprises me. I'm not knocking this granola-- because it is really good-- but of all the recipes posted on this blog, I'd never have guessed you'd like this one the best! I have something fun for you today: a guest recipe post from Holly over at [Im]perfectly Balanced. Holly lives in Dallas with her husband and their adorable dogs, but she and I know each other because she's one of my clients at my day job! We bonded when we met in person for the first time and discovered each other's blogs. Holly's lifestyle blog is so fun to read: full of simple recipes, home renovation projects, entertaining ideas, and tons of southern charm! Stop on over to [Im]perfectly Balanced for a visit, but in the meantime check out this adorable cake idea she's sharing here today-- a presentation that's just perfect for Thanksgiving! Beginning in October, it seems like the Fall/Holiday parties are underway. And once they start it's like they never stop. I wanted to create a fun dessert that you can take to any Fall party whether it's a hostess gift, your dessert for a potluck dinner, or even an office party. The solution: 3-D Pumpkin Cake! It might sound daunting, but it couldn't be more easier and quick to whip up! Pull together ingredients for your favorite boxed cake or your top secret homemade recipe. Usually I use my mom's pound cake recipe which I can't give out so I used a boxed cake mix and it tasted delicious! A spice cake would even be perfect for this. Dust off and polish your Kitchen Aid Stand mixer because she will make your life a tiny bit easier here. Simply put all of the ingredients in your mixer and begin mixing slowly then speed up after most of the flour has mixed in. You want to be careful and not over mix your ingredients while looking for a creamy consistency. It's okay if there are a few pockets of flour still in the batter, just make sure the butter is evenly mixed throughout. (A good tip is to make sure your butter is softened before beginning this recipe). You'll need 2 bundt pans for this cake. If you really want this to look like the perfect pumpkin then you can use these cake molds. Grease your bundt pans lightly. This is my favorite spray out there for baking (from Williams-Sonoma): Bak-Klene ZT Nonstick Baking Spray. Then pour the batter into the bundt pans and place in the oven! Then unfortunately you have to wait, but it's not a long wait and your house will smell amazing! Once the cakes are cooked, you can place them on a wire rack where they need to cool completely. If they are warm at all the icing will melt right off. Put your icing into a bowl and begin to mix your food coloring. This is the part that's not an exact science. Continue adding drops of yellow and red food coloring until you reach the color of orange you desire. I believe I got up to about 14 drops of yellow and about 12 of red. Now we're ready to ice the cake! Flip over each of your bundt cakes and make sure the tops of them are flat. If not, you may have to cut off a little to make the surface even. Using a long serrated knife, simple trip off a little of the top of the cake at a time until it's even. Remember, it doesn't have to be perfect. Next, ice the top of the bottom layer then stack the two cakes. Then continue icing the rest of the cake. Since I was taking this to a work party the next day, I iced the cake and let it set over night. I took some of the leftover icing and added some more food coloring to create a deeper orange. This will give some more depth to the cake. Once you are at the cake's final destination, take the deeper orange icing and ice vertical lines around the pumpkin. Then you can take some tootsie rolls and mold together to create a stem for your cake. I couldn't seem to find any tootsie rolls so I took a piece of brown felt and cut out the shape of a stem and place in the middle of the pumpkin cake using toothpicks. And there you have it! 3-D Pumpkin Cake! 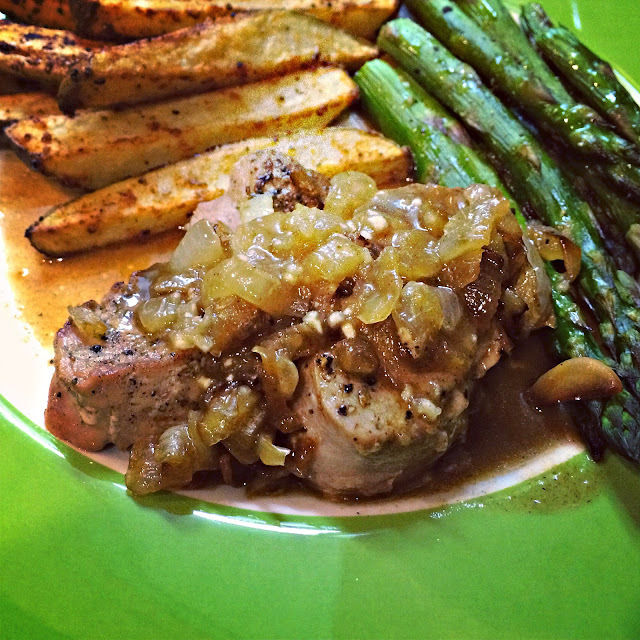 This pork dish has all of the great flavors of fall that I just love-- sweet apple cider, tangy Dijon, savory garlic and shallots, and a hint of brandy create the perfect sauce for a simple pork tenderloin. Sometimes I run out of creative ways to prepare a pork tenderloin, which is not good since my grocery store often runs a special on them and I always have one or two in my freezer at all times. So, when I picked up some apple cider recently and came up with this delicious pork recipe inspired by it, I felt like I need to run and share it with you. I assume I am not alone in my pork prep problems? Right? In this dish, the tenderloin is cut into medallions, which I don't often do. I found it makes plating prettier and it also helps the pork to cook a lot faster-- this is key if you don't have all night! This is a prefect seasonal dish that is impressive enough for company and easy enough to prepare on a weeknight too. Enjoy! Melt butter and oil in a cast iron (or other oven-proof) skillet over medium high heat. Add shallots and saute for 3-4 minutes, stirring frequently. Add garlic and cook for 1 minute. Slice the tenderloin into 4 even medallions. Season pork with salt and pepper and add to the pan. Cook on both sides until brown, 4-5 minutes on each side. Transfer to a plate. Add brandy to the pan and cook for 3 minutes while scraping brown bits from the bottom of the pan. Raise heat to high and whisk in the apple cider and Dijon. Bring to a boil, reduce heat to medium and simmer for about 5 minutes or until sauce begins to thicken. Add pork back to the skillet and turn to coat in the sauce mixture. Place skillet in the oven and cook for 10 minutes. Remove from oven and plate the medallions. The sauce will have thickened in the oven, but if it isn't thick enough for serving you can cook it on the stove for an additional 3-4 minutes. Spoon over the pork and serve. After Alex and I left the quiet little village of Kohler, Wisconsin we headed south to Milwaukee for some fun and sightseeing. Milwaukee is only about an hour and a half drive from Chicago, but I have actually never visited before and Alex had only been once in college-- and they went to the museum and then to Hooters. Classy. So, we decided to spend some time there on Leg 2 of our long Wisconsin weekend. We started the weekend off exactly as you should when in Milwaukee: on a brewery tour. Friends, colleagues, and tour guides overwhelmingly recommended the Lakefront Brewery tour as the one to try and they were right-- it was fantastic! This tour starts the way that every brewery tour should start: with complimentary beer in their spacious tasting room. In fact, the $7 tour includes 4 complimentary beer tastings (which can be used before, during, and after the tour) and a souvenir pint glass. The tour guides here are informative, but also hysterical. Ours loved heckling people on the tour, starting chants about beer, and forcing us to do embarrassing things-- like sing the Laverne & Shirley theme song while a bottle with a glove on it whizzed by on an old fashioned conveyor belt. This was the best brewery tour that I've been on-- and the beer is really good too! Alex has a six-pack of their Wheat Monkey beer in our fridge right now. Another perk of the tour? Each of us received a coupon for a free Lakefront Brewery beer at a handful of local bars. While we were out wandering the city that evening, Alex and I popped into Mo's Irish Pub for a couple of free Pumpkin Lagers and a snack. On our walk to dinner, Alex stopped on the River Walk to pose with a few ducks. What can I say? The guy just loves ducks. We got going early the next morning to walk across town to see the Milwaukee Art Museum. 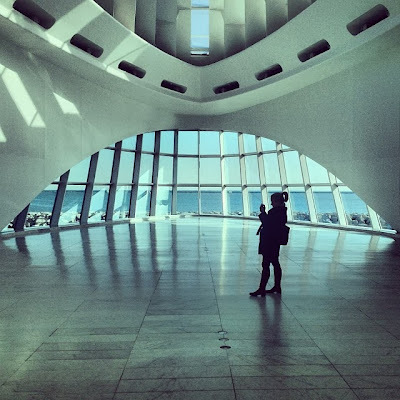 The Museum was designed by Santiago Calatrava to look like a bird and every morning at 10 AM you can watch the "wings" open. It's really cool to see-- and was especially beautiful that morning with a clear sky and the Lake on the background. We wandered around inside the main lobby to check out the space and the views, which were equally breathtaking from inside. Being inside buildings like this remind of why I wanted to be an architect (even though I no longer am). You can't help but feel inspired by a space like that. On our way out of town we made one more architectural pit stop at the Mitchell Park Horticultural Conservatory Domes. These three giant glass domes each house a collection of flora and fauna that can be found in certain climates: one dome is dedicated to desert flora and fauna, another to plants found in tropical climates, and the third is the show dome. The theme in this third dome changes seasonally and when we visited it was all about 1950's America. There were mums, white picket fences, and other very traditional American house and garden plants arranged throughout the dome while a musician played classic 50's tunes on a piano. Apparently they do a great holiday-themed exhibit in the month of December too. Also, one of my co-workers sent this New York Times article to me right before our trip and it's super helpful if you're looking to pack all the Milwaukee "must sees" into a 36-hour weekend. Enjoy!